Who is the man who will try to prove Oscar didn’t deliberately kill Reeva Steenkamp? We take a closer look at Barry Roux. Oscar Pistorius' trial lawyer has fought and won a string of high-profile criminal cases but found celebrity status when millions followed the athlete's three-day bail hearing last February like a reality television show. 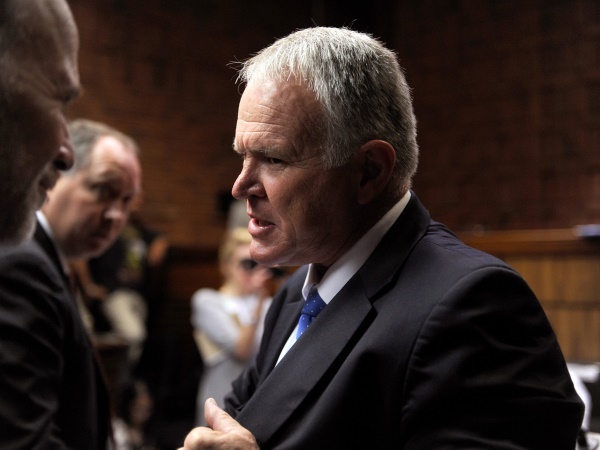 Barry Roux earned praise in media around the world after he successfully argued during the hearing that the evidence placed the onus on the State to oppose bail, and dismantled its argument that the Paralympian was a flight risk. The Guardian said his dramatic "master class" in cross examination was like watching a baby seal – in this case investigating officer Hilton Botha – being clubbed to death. Afterwards, Roux was modest, perhaps mindful, that the State had had only six rushed days to prepare and that Botha had failed to perform checks on evidence found in Pistorius' home. Leaving court, the lawyer told reporters his day had been "nothing special". He lent over to Pistorius, took his hand and said: "You're going to be okay." Earlier, before the ruling, he had lent over to Pistorius, taken his hand and said reassuringly: "You're going to be okay." Roux's career spans more than 30 years and he has been described as a thorough and ethical lawyer who would do his best for every client. Some of his successes were secured after years in court. These included Scottish-born businessman and former Rangers football club director Dave King, who risked jail for ignoring the country's biggest-ever tax bill of R2,3 billion and faced a lengthy jail term. After a 13-year court battle, the case ended in what some observers described as an anti-climax, with the court ordering King to pay the far smaller amount of R700 million in revenue owed. King cooperated with the SA Revenue Service, escaped jail and maintained that profits he had made on selling shares were perfectly legal and of a capital, not a revenue, nature. The case potentially had vast implications for the rest of South Africa's rich if the question of capital and revenue profits went all the way to the Constitutional Court, but the settlement Roux negotiated meant it never landed there. Roux acted for former JCI chairman Roger Kebble on charges of tax evasion, which were withdrawn in 2007 because the State lacked evidence. In the 1990s, he represented apartheid-era general Lothar Neethling, who sued Die Vrye Weekblad newspaper over claims he had supplied former police captain Dirk Coetzee with poison used against anti-apartheid activists. Neethling failed in the high court, but the appeal court overturned Judge Johann Kriegler's decision and ordered the paper to pay R90 000 plus costs. The damage order and the cost of a five-year legal battle finally forced the newspaper to close. In the Pistorius trial, Roux will square up to seasoned prosecutor Gerrie Nel, who secured the conviction of former police chief Jackie Selebi. Last year as the bail hearing unfolded their legal arguments were tweeted and televised around the world. At least two stations plan to dedicate separate channels to rolling coverage of the Pistorius trial, which has drawn comparisons to the OJ Simpson trial.